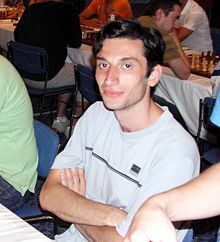 Baadur Jobava (Georgian: ბაადურ ჯობავა; born 26 November 1983) is a Georgian chess grandmaster and three-time Georgian champion (2003,2007, 2012). He won the Dubai Open in 2003 with a score of 7 points out of 9. He took the gold medal at the 2004 36th Chess Olympiad, scoring 8½/10. He took part in the FIDE World Chess Championship 2004, where he was knocked out in the first round by Ruben Felgaer. He won the 2nd Samba Cup in Skanderborg, Denmark in 2005. In 2006 Jobava won the Railyaway Hotel Cup and the prestigious Aeroflot Open. In 2008 he tied for 1st-8th with Nigel Short, Vadim Milov, Aleksej Aleksandrov, Tamaz Gelashvili, Alexander Lastin, Gadir Guseinov and Farid Abbasov in the President's Cup in Baku. In August 2011 he tied for 1st-2nd with Hrant Melkumyan in the Lake Sevan tournament in Martuni and won the event on tie-break. In December 2011 he won the 32nd Edoardo Crespi Trophy in Milan with 8,5/9, finishing two points ahead of second placed Vladimir Malaniuk. In the same month Jobava won the European Rapid Chess Championship in Warsaw ahead of 746 players. In January 2014, Jobava finished equal second and third on tiebreak in the Tata Steel Challengers tournament in Wijk aan Zee scoring 8.5/13. In the following month he won the David Bronstein Memorial in Minsk on tiebreak over Sergey Fedorchuk and Mikhailo Oleksienko. In July he finished second behind Wesley So at the ACP Golden Classic in Bergamo, Italy. In August, 2015, he took clear first place in the 19th HZ Chess Tournament in Vlissingen, the Netherlands, scoring 8/9 points (+7=2-0). He has taken part in the Chess Olympiads of 2000, 2002, 2004, 2006, 2008, 2010 and 2014. In the 2010 Olympiad, he defeated the world's number one player Magnus Carlsen in the Georgia-Norway match.